The baha™ implant is a titanium osseointegrated cochlear conducting device that is implanted into the skull just behind the affected ear. It is useful for the auditory rehabilitation of properly selected patients with either conductive (mechanical), sensorineural (nerve), or mixed hearing losses. Patients with inoperable conductive hearing loss, such as severe congenital aural atresia (non-formation of the ear canal and middle ear), chronic otitis media with canal wall down cavities or other complications, only-hearing ear otosclerosis, etc. should be evaluated as possible baha™ candidates. In these cases, the processor vibrates the skull, sending signals directly to the same-side cochlea (inner ear), and allowing the patient to bypass the nonfunctioning external and middle ear and stimulate the properly functioning inner ear directly. Hearing is very close to natural sound, and sound localization is excellent. 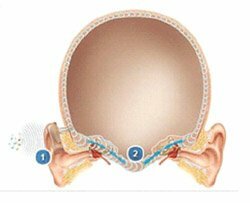 Patients with single-sided deafness (SSD) from either sudden sensorineural hearing loss that did not recover, end-stage Ménière’s disease, acoustic neuroma resection, etc. should be evaluated as possible baha™ candidates. In these cases, the processor vibrates the skull, sending sounds to the opposite-side cochlea (inner ear), from whence they are transmitted to the brain and heard. Patients report that the baha™ for SSD restores their sense of 360 degrees of sound around them. Although there is poor localization of sound, because the same inner ear is used for hearing from both sides, patients experience an ability to be much more aware of all surrounding sounds. Additionally, if their good ear is occupied (such as with a telephone), their baha™ device permits them to stay connected with their environment, which is not possible otherwise with SSD. If there is a conductive (mechanical) hearing loss in addition to a sensorineural (nerve) hearing loss in the same ear, the patient should be evaluated for baha™ candidacy, albeit with some caution. If the remaining nerve hearing is of a moderate hearing loss level or better, a more powerful sound processor can be used to drive the hearing similar to that in a conductive hearing loss patient. Patients first undergo a thorough examination by Dr. Kohan. At the time of the office visit, the patient’s hearing is judged by the use of a tester baha™ unit via a snug head band. Often, patients are astonished and pleased by the amount of hearing that is restored to them when the speaker talks to them from their ‘bad’ side! A complete audiometric evaluation is performed, followed by a baha™ tester audiogram (hearing test). Necessary CT scans and MRI scans are ordered, to either look for the cause of the hearing loss, or ensure that there is no other condition that requires treatment. The surgery is performed under general anesthesia, and takes approximately 45 minutes to 1 hour. A small area of skin behind the ear is shaved. The device is placed under sterile conditions so as not to interfere with proper osseointegration (becoming one with the skull bone) of the device. A pressure dressing is placed over the site and left in place for one week. Postoperative wound care requires diligent cleaning of the site, after the initial bandage is removed one week later. The device is permitted to osseointegrate for a period of two to three months before the external sound processor is placed. This is done in the office. The patient is counseled regarding use of the processor by the audiologist. Patients are seen in the long-term at least once annually to check on the site, the abutment, and the device. Patient satisfaction with this device is very high. If you have any questions about BAHA Hearing Aids or Surgery and would like to schedule a consultation with the leading New York City hearing specialist, please feel free to call Dr. Kohan’s office for an appointment at (212) 472-1300.